HTC’s year took a turn for the better with the HTC One M8. The M8 was dubbed as one of the best smartphones for this year, and as expected an M9 is set to follow shortly. Naturally, the successor is much awaited and will have people on the edge of their seats as the M9’s release nears. 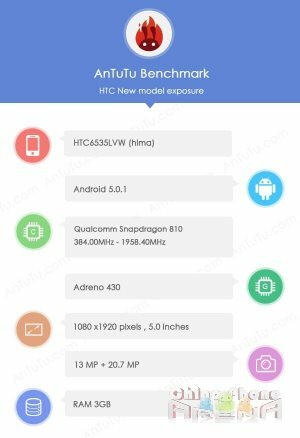 So far, rumors have been confirmed by means of AnTuTu benchmark results, when the M9 popped up on their database. The M9 will be featuring a Qualcomm Snapdragon 810 octa-core processor, which runs on 64-bit architecture. Its CPU will be clocked at 2.9GHz max, and the phone has a hefty RAM storage, specced at 3GB. The screen is sized at 5.0 inches with a 1080p resolution display beneath it. Camera specs are simply insane, with the rear camera carrying a 20.7 MP sensor, and the front-facing secondary camera having 13MP maximum resolution. The front camera is rumored to be an UltraPixel camera. The M9 will have Android 5.0.1 running the show with HTC’s own Sense UI at the frontline. HTC has been handing out invites to CES 2015 in January, which may indicate a possible announcement of the HTC One M9 “Hima” model at the event.